How to Pass a Competency Based Interview? Competency based interview is the most popular forms of the interview that is been adopted by most organizations these days. It is because this type of interview session allows interviewers to judge about skills and abilities of the candidate. The employers can know the realistic skills and capabilities that the interviewee possesses. This form of interview is more structured and systematic. Each question listed under it can target a particular competency of the candidate. Moreover, it is also an opportunity for the interviewee to present their skills in an impressive manner to the employer. It, therefore, becomes vital for the candidate to pass this interview. So, what is the finest approach to get through the competency based interview and how you can pass how to pass competency based interviews with confidence and ease? Check it out! 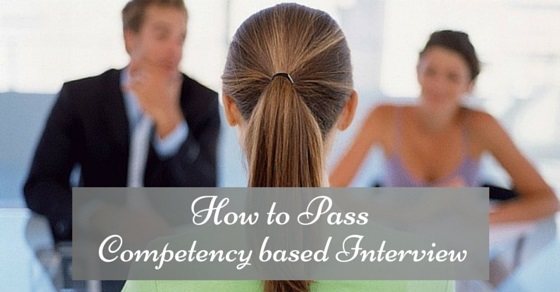 The following mentioned are few competency based interview tips for how to pass a competency based interview. This may sound repetitive to you, but this is the way to succeed in all kinds of interviews. The key policy is to outline answer for basic competency questions interview in advance. Practicing them is required to make sure that you deliver a solution in a natural way. You must, therefore, plan in a way that you can answer even a difficult question with ease. Make sure you also practice to retain your confidence and enthusiasm while answering the questions. Not all, but most of the companies will offer you with a list of core skills on which you will be assessed and tested. Most of such skills are listed under the job profile. A good recruiting firm will be able to aid as they must have had similar candidates in this process. Even a direct recruiting manager will have access to all the information. In case the hiring team is not willing to supply full information then you may ask them the reason. There are two different methods known as STAR and CAR to answer competency interview questions. You can employ any of these approaches to learn answering the questions in a natural way. It will also allow the employer to ask more questions to you. If he is willing to do so, then it is good, as then he will be more engaged in conversing with you. It is a definite indication of passing the interview. There are some conventionally trained interviewers who only follow the rules and may show no emotion during the time of interview. Even they may not allow you to show any of them. They may ask you plenty of questions to get you through in a small period. But don’t let this set back your confidence! Try to use the time wisely and make sure to answer questions in a way that it seems impressive to the employer to crack the interview in one go. Almost all employers are aware that the candidate will come prepared for basic questions in advance. So, you must be ready well for the unexpected things to happen. Don’t get surprised if the interviewer asks you questions related with the ambiance of office or about new products launched by the company. It is because; at the time of the interview he is free to ask questions that can help him judge your work competencies. It may also happen that he may give an example of his experience, rather than asking yours. So, it is better that you prepare yourself mentally to face such situations, and you may give a confident answer to strange questions like these. 1. Explain a situation when you take a risk and lead a team towards accomplishing a particular project? What were the end results? 2. Describe situations where you were as a team leader required improving the performance of your team? What actions did you take in this regard? 3. What you think is the best mode of internal communication for an organization? 4. What steps according to you are required for maintaining good relations with the customers? What you may do to make sure that they are satisfied with the company? 5. Do you keep yourself updated with latest marketing trends? 6. How do you deal with different colleagues and how do you handle situations if you are asked to work with them? 7. What will be your action plan if you are made to work to meet strict deadlines? 8. Have you ever met a situation to make an important decision even when you do not have much information with you? How do you manage such situations? Are your decisions able to deliver desired outcomes? 9. Can you explain me what methods do you adopt to analyze a problem? How do you develop solutions after analyzing a problem? 10. Explain how do you manage workloads and how you multi-task within the work organization? While everyone has its answers to each question asked during the competency based interview, here are some answers that you can go through. They might help you frame your answer in an impressive and concise way. These answers are based on the ‘STAR’ approach, in an uncut form Situation, Task, Action and Result based technique. 1. Question – When was the time when you witnessed a potential conflict of interest at work? Answer – Action: Regardless of personal monetary incentives, I have always maintained to treat all clients equally and work for best of their interests. Hence, I have always devoted equal time to all my customers, have put in overtime if regular working hours are not able to deliver. 2. Tell me a situation at work when you felt guilty? Answer – Task: During my initial years as an advisor, I came across an article that stated that a giant public utility company had made purchase arrangements by a bigger conglomerate. It led to a potential increase in prices of the share. The article was later posted on a reputed finance website, and I found the source to be credible. 3. Brief us about a time when a co-worker or a manager made a decision that was against your moral terms? Answer – Task: One of my fellow financial advisors working on a different compensation structure charged a certain percentage of assets under management per year. I planned an informal meeting and mutually discussed the topic. I informed him about risks that he could face if he continues to do such things in future time as well. 4. At what times you have managed to convince people with a conventional mind to adopt and implement new ideas? Answer – Action: During a meeting with senior executives, I explained to them why modern branding techniques are better and needed as compared to conventional ones. I even proposed them to use updated technologies for the business such as social media to target potential customers. I also explained them about the requirement of a sound and professional website for our company and how it can help the company in increasing its overall revenue. 5. Tell me about a situation that required your original and creative input? Answer – Result: Disputes between management and staff were very common. So, I conducted an employee satisfaction survey so that the management gets aware of problems that the team is facing. I even recorded conversations of some unhappy employees and presented that to the management to make them analyze the issues which their team is facing and take corrective measures towards it. 6. Provide an example of a situation when you made a decision based on rational and logical thinking? Answer – Situation: When recruiting for additional staff I was ultimately responsible for the selection procedure. Naturally, I can’t hire people based on my gut feelings or personal bias. I, therefore, introduced a method of selection procedure that incorporates multiple psychometric tests, exercises, and a competency based interview session. Competency based interviews help organizations to secure more precise competency based recruitment decision. It helps in developing a standardized recruitment within the company. Employers are able to judge the candidate’s for various job competencies such as interpersonal skills, communication skills, strategic thinking, teamwork, organizing, planning, analytical thinking, and more, with the help of this form of interview. For such reasons, companies wish to hire this method of discussion. For interviewees to pass such interview, it is essential, to be honest, stay relaxed, confident and showcase their answers in such a way that it can impress the employer. Besides this, behaving genuine and truthful are the core keys that can assist candidates to pass this exam.